In order to determine which of your landing pages converts the best, CAKE allows you to set up rules to split test your traffic. Although the rule allows for splitting multiple landing pages, in our example we will be splitting traffic between only two. Step 1: Setup your 2 Landing Pages using Offer Contracts. Offer Contracts will allow you to place a second landing page so that you can split traffic among the two pages. 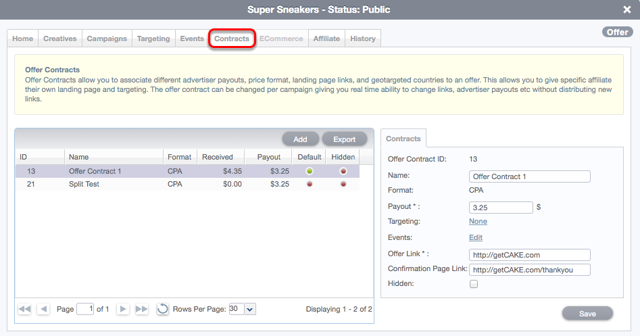 Within the Targeting tab, select the Offer Contract upon which you are applying rules. This is done on the top right of this tab. Within the drop-down, select Rules and click Apply. Click the New Rule button (assuming you haven't set this up previously and saved the rule as a shared rule to be used later). The Shared checkbox to the right will allow you to share this new rule among other offers. Select your second Offer Contract as your Redirect destination for the split traffic. Select "Percentage Split" from the Add Rule Target drop down. After selecting "Percentage Split", a new window will pop up asking you to enter the percentage for this split. For our A/B split test example, we will enter 50. Click save to lock in the 50% split, then click Create to complete the rule. All of your affiliates will be running traffic to campaigns associated to your default Offer Contract, but through the new rule, CAKE will split the traffic between Offer Contracts, resulting in two campaigns which can be compared in your Offer Contract and/or campaign level summary reports. How Do I Setup A/B Split Testing? How Do I Setup Rules Targeting? How Do I Use the Feature Landing Pages? How Do I Test an Offer?